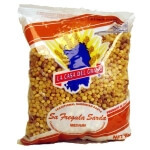 Afletra's Mezzoa Pacchero pasta is a smooth, rather thick tube of approximately 1 inch long, with a diameter of approximately 1 inch, that should be cooked 'very al dente', at least if you want to follow 'the old days'. This pasta is a mouthful and can be served with smooth sauces or with chunky sauce as the opening of the tubes is big enough for anything. The cooking time for this Mezza Pacchero pasta is 13-15 minutes. 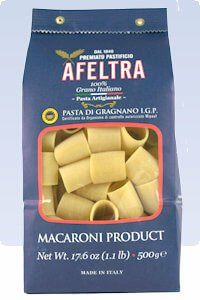 Afeltra pasta is artisan, handmade and extruded through bronze, they way they did it centuries ago. This procedure gives the pasta an exceptional flavor, thanks to the rough, porous surface which holds the sauce.